Dealing with missing teeth isn’t merely embarrassing in social situations, though the self-image factor is certainly substantial. Individuals who are missing even a single tooth are at a higher risk of developing periodontal disease and bone loss in the jaw. Dr. Colin Holman and Dr. Natalie Frazier at Dental Expressions in Oklahoma City, OK offer a variety of tooth replacement options, including dental implants, to repair and rejuvenate incomplete smiles. A consultation at Dental Expressions will help you and your dentist determine which tooth replacement procedure is best for you. If Dr. Holman and Dr. Frazier find that you are, in fact, a good candidate for dental implants, you’ll be walked through the steps of the process from beginning to end before the final decision is made. For many patients with one or more missing teeth, dental implants provide the ideal solution to diminished functionality and self-consciousness in one straightforward procedure. 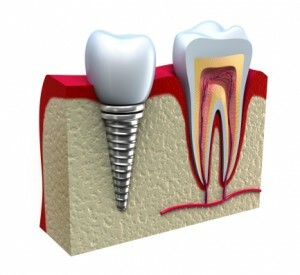 First, a small post made of titanium is placed precisely into the bone of your jaw and the tissue of your gum. This anchor is then topped with a beautifully crafted porcelain crown that has been shaded exactly to match the rest of your teeth. When cared for properly, dental implants can last a lifetime, giving you the ability to enjoy your favorite foods again and smile freely. Don’t suffer through one more day with missing teeth – life is too short to spend hiding your smile! Contact our office in Oklahoma City, OK today to find out how Dr. Holman and Dr. Frazier can help you replace your lost teeth with dental implants. Our team also happily welcomes patients from throughout the surrounding communities of Midwest City, Norman, Moore and beyond. We can’t wait to give you back your smile!